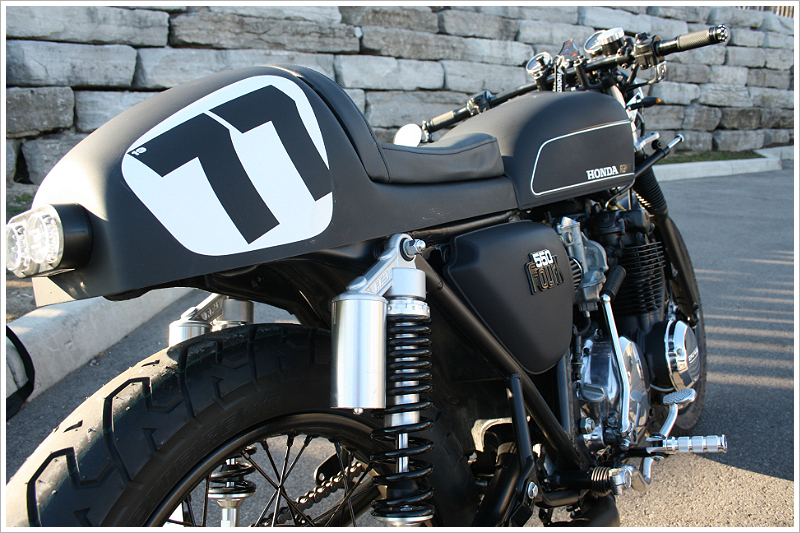 To be honest, when I think of café racer culture, Canada is not one place that immediately springs to mind. 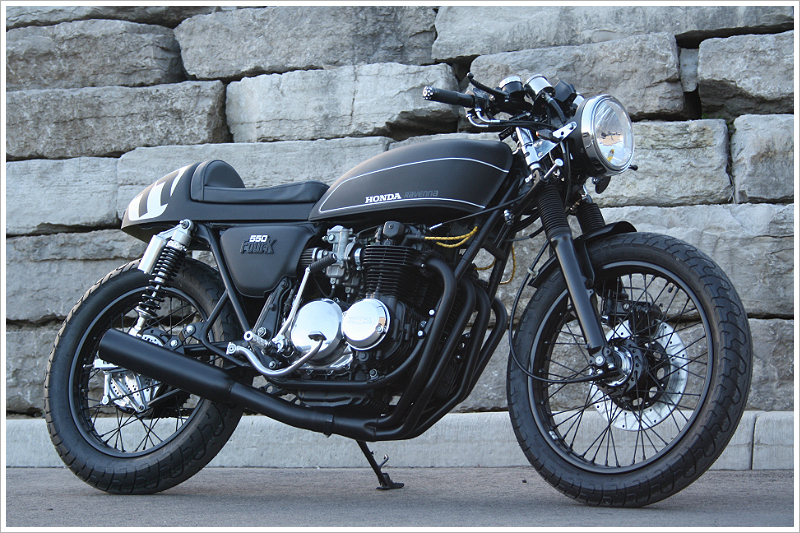 Even our featured bike’s owner, Andre, admits “in Canada, café racer culture isn’t too vibrant, but I was lucky to find the one guy near Niagara that could make my dream a reality”. That guy is Adam Gaspic, from Gasser Customs, a relatively new bike workshop that has pumped out some very decent projects during its short existence. And Andres’s bike, Ravenna, is no exception. In Canada, where bike riding is only feasible for half the year, the bike one chooses has to be twice as awesome – to make up for lost riding time. 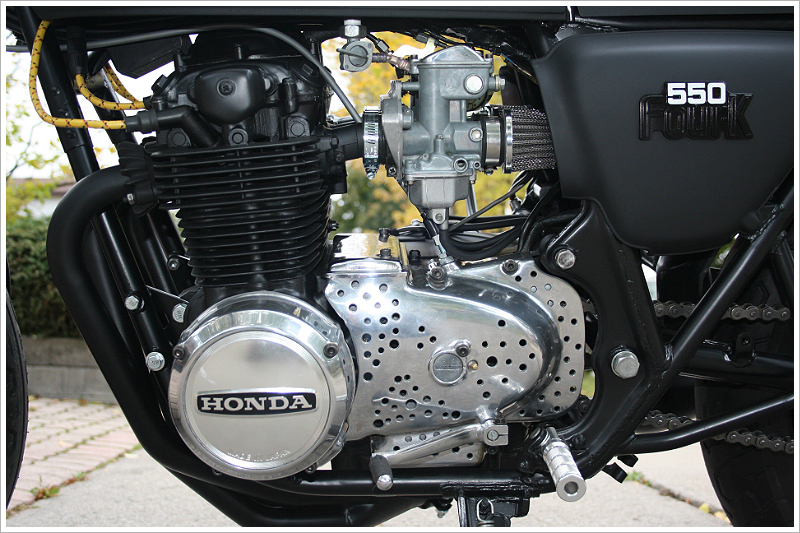 Andre looked for a base for a café racer project, and found it in a Honda CB550/4 in Ontario, 7 hours drive from where Andre lives. An average looking mid 70’s bike, Andre was able to see past the duct tape on the seat, and the almost novelty oversized factory indicators, to see a bike that could one day grace an article on Pipeburn. And here it is. 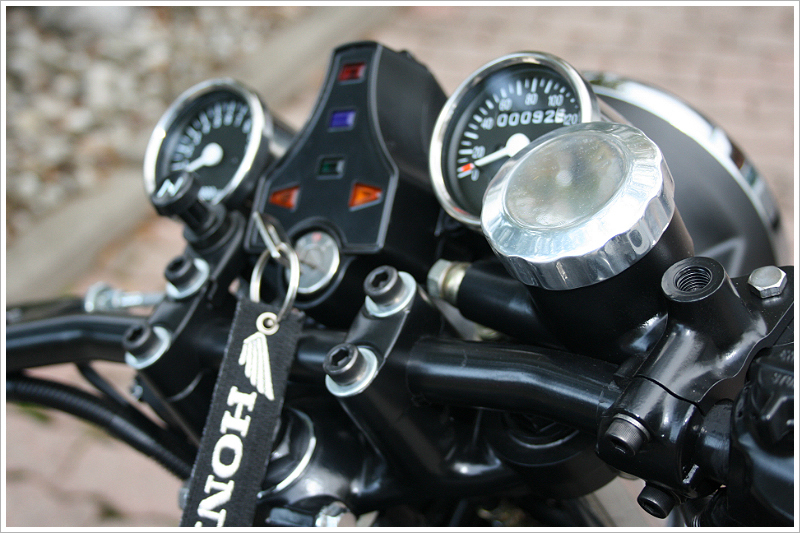 After the CB550 crawled into Gasser’s workshop, Andre left for a holiday in California, to catch up with friends. One of his friends he met up with was Steve Carpenter of Nostalgia Motorcycles. After touring Nostalgia’s workshop, and seeing some of their café customs, Andre left for home, pumped up by what he had seen. Many a meeting was held between Andre and Adam, then Gasser Customs got to work. Matte black is the paint of choice on this bike, with some polished up bling breaking up the dark outlines of this awesome machine. 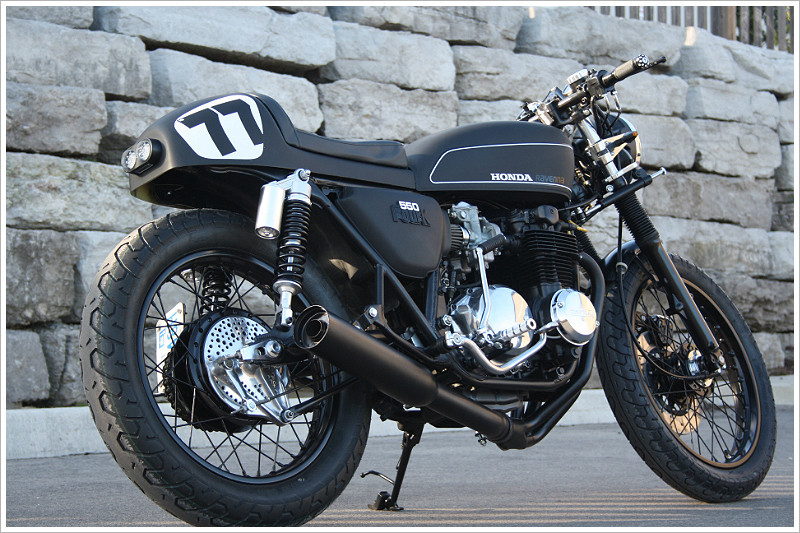 Black rims, black front guard, black sidecovers all add to the dark flavour this bike has taken on. 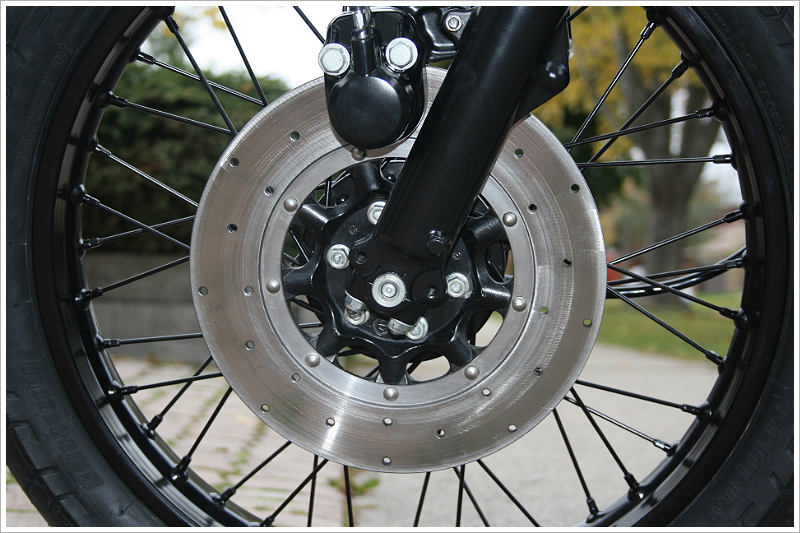 The tires are Bridgestone spitfire S11’s, carbs are stock Keihin – rejetted for the exhaust and pods. 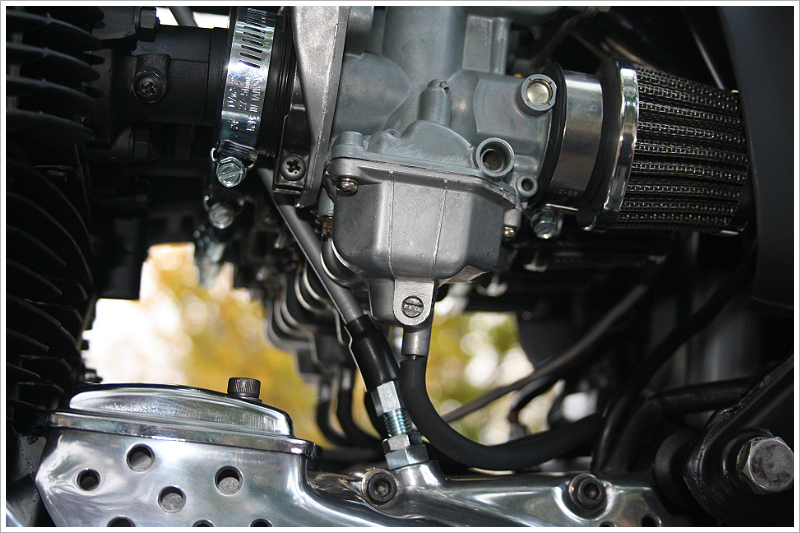 They also installed a steering damper for high speed stability. The factory seat has been ditched, in its place a custom made fiberglass bump with integrated tail light. 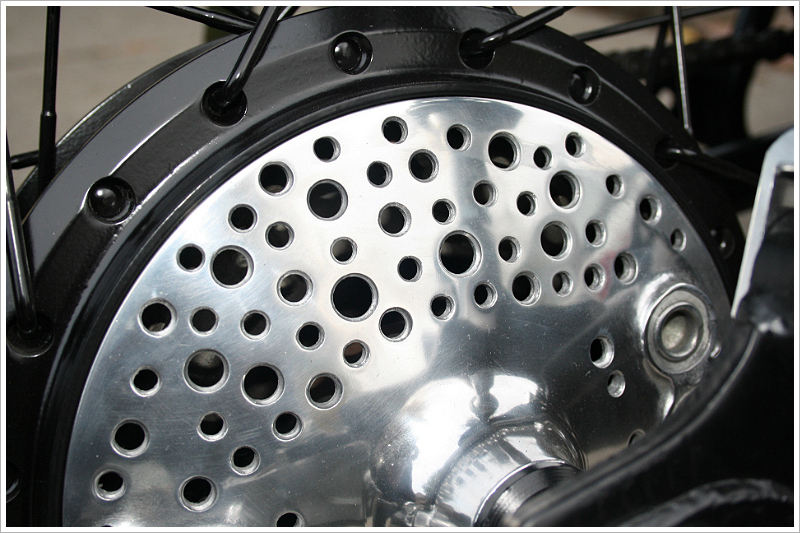 Gasser Customs has added a ‘swiss cheese’ cooling style, with the crank sidecovers and rear brake drum cover being drilled numerous times. Not feeling the factory 4 into 2 exhaust, a 4 into 1 exhaust has been fitted, painted matt black to match the rest of this custom Canadian crotchrocket. Adam completely disassembled the engine and reassembled it to special Gasser performance specs, also upgrading the charging system. While waiting for Adam at Gasser’s to work his magic, Andre decided to look into the history of the bike. He came across a familiar name in the list of former owners, one being a Miss Trillium Muir, who learnt to ride on this bike. This happens to be the same Trillium Muir who in 2009 took her turbo Hayabusa to 239.36 miles an hour, making her the fastest woman in the world. So the bike has some rather decent providence. When Andre let Trillium know that he was rebuilding her stock learner’s bike, she was thrilled. I bet she would be even more thrilled now that it is finished, and the amazing finish Gasser has put on it. Now Andre spends his riding half of the year on his mucho aesthetically pleasing café custom, praising the work of Adam and the Gasser workshop. However, with Adam and his starlet wife looking to relocate to LA to follow both of their dreams, Andre can take pleasure in owning and riding such a rare beast – especially in his part of the world.